Texture translations features three performance artists tracing a lineage of personal and ancestral histories through materials that transmute into personal becomings. 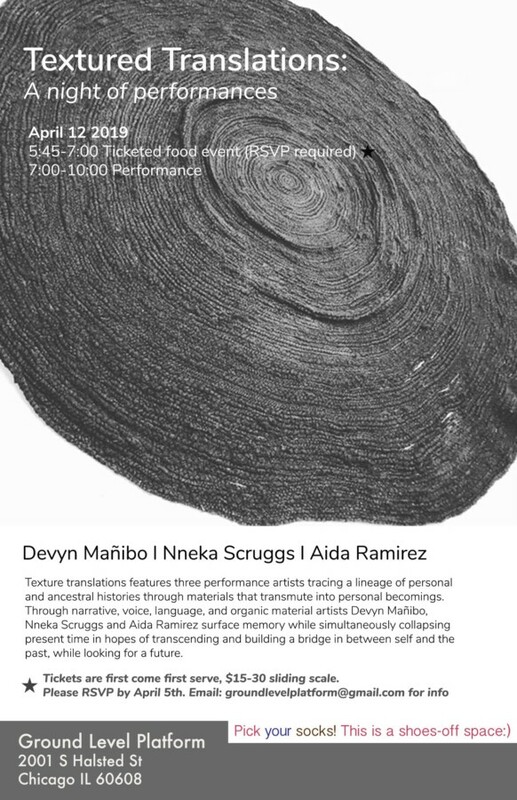 Through narrative, voice, language, and organic material artists Devyn Mañibo, Nneka Scruggs and Aida Ramirez surface memory while simultaneously collapsing present time in hopes of transcending and building a bridge in between self and the past, while looking for a future. *5:45-7:00 P.M.: Poet and maker, Devyn Lorelei Mañibo engages us with ‘a meal to be shared with the hands, ranging from sweet and sumptuous to gloriously bitter’ translating taste, archive, and the body. 7:15-8:00 P.M.: Artist, Nneka Scruggs traverses through an ‘underneath’ space with a ‘phantasmic essence’ implicated in now as she opens wounds that allow for black femme voices to take space. 8:15- 9:00 P.M.: Artist, Aida Ramirez translates words through body gestures into a circuit of becoming in meditation with the histories her body carries.